Larmer Property are delighted to bring to the market, this 2nd floor 2 Bedroom Apartment, at No. 8 Russell Court, Monaghan, Co. Monaghan. This apartment has the benefit of 3 No. windows fronting on to the main street and two overlooking St. Josephs church. The property is lovely and bright, with a feeling of additional space than the Square Metres might suggest. 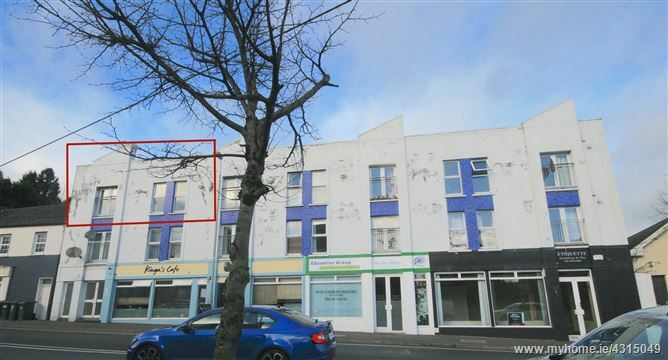 The property is centrally located in Monaghan town along the Broad road with an abundance of amenities on your doorstep, shops, schools, offices and Coffee shops on your doorstep. Utility area with Microwave & Freezer included,and space for a dryer. Spacious Living / dining area with french doors opening onto the main street. Scenic views of St. Josephs from the kitchen window. Solid wood floor and wall mounted kitchen units. Part tiled walls and Laminate timber flooring. Spacious double bedroom with built in wardrobe. Laminate timber flooring & ample plug points. Single bedroom with laminate timber flooring. Chest of drawer and locker. Fitted Bathroom suite - Bath, W.c., Wash hand basin and overhead shower. Fully tiled floor and PVC walls. Fitted towel rail, Mirror and Shaver light.